Dee Bar Weddings offers a beautiful setting for your special day. With gorgeous views of the Cascade Mountains and an arched bridge for photos, the venue is able to fit a variety of themes and ensure beautiful bridal memories against the perfect backdrop for a very special day. The location is not limited to weddings; they’ll happily host any special day. 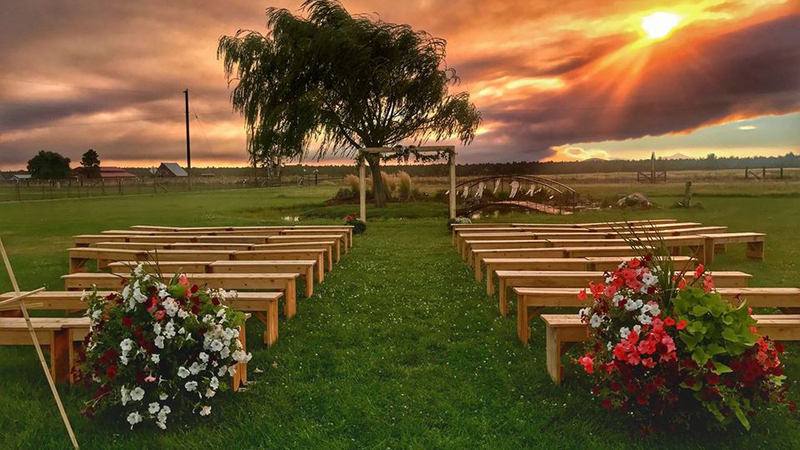 Dee Bar Weddings is located on forty acres of irrigated pasture in beautiful Powell Butte, between Redmond and Prineville. It’s an easy-to-find location located close conveniently to the Redmond Airport and has ample parking. Featuring an air-conditioned bridal changing area, a pavilion and a dance floor, the venue is suited to a variety of wedding sizes and themes, from rustic to elegant. Their season runs from May through October. Guests are welcome to use any vendors and caterers, giving complete freedom to customize your event. The venue is unusual in offering access from 4:00-10:00 p.m. the day before your event and from 9:00 a.m. to 12 p.m. the following day.